For the first time ever, IVECCS will be hosting a tournament where you can show off your hospital’s CPR prowess! Teams from all hospitals are invited to participate in this competition, which will utilize state-of-the-art simulators with pulses, heart and lung sounds, and more to mimic real life cardiopulmonary arrests. RECOVER certified trainers will judge teams not only on how closely each team follows the RECOVER CPR algorithm, but also on their communication and teamwork. Each team will debrief after their code, allowing the audience insight into their efforts and results. Whether you want to show the ECC community how great your hospital’s CPR team is or you want objective feedback on your CPR efforts, this is one battle you won’t want to miss. 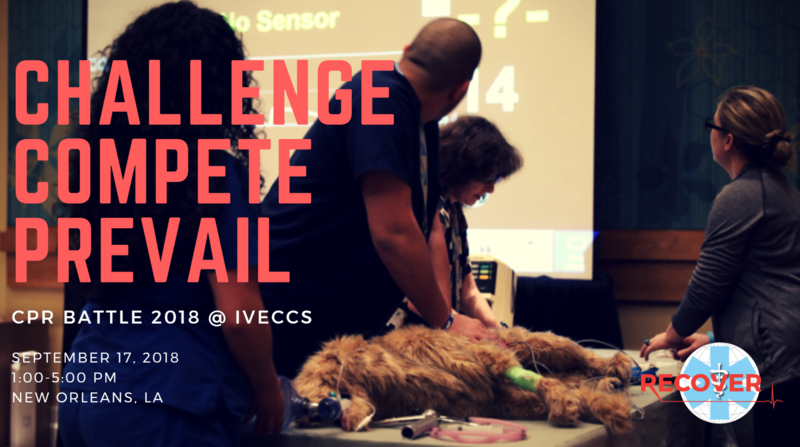 Even if you aren’t competing, come watch and learn from your colleagues and some of the world’s leading experts in small animal CPR. In addition to bragging rights, the winning team will receive a prize in recognition of their accomplishment. Come join your colleagues from across the world in this exciting, educational event. Teams: Teams will consist of 4 members. It is required that at least one veterinarian is on each team. The remaining team members can consist of technicians/nurses, veterinary students or additional veterinarians. Team members do not all have to come from the same hospital (multiple hospitals may be represented on each team). While BLS and ALS certification is not required for participation, it is encouraged. If you’re not already certified, you can take the online CPR course on the RECOVER website. Participating teams will receive more detailed information regarding the event prior to arriving at IVECCS. Registration information: Teams may register for the event through the IVECCS Registration Page and is open until August 19, 2017. A total of 8 teams can participate in the event. Should more than 8 teams register for the event, the final 8 will be selected via a lottery. All teams will be notified if they are part of the final 8 by August 30, 2018. There will be a one-time registration fee of $25 for each team. This fee will be made payable to VECCS by September 12, 2018. Standard of Care: The RECOVER guidelines will be used as the standard of care for delivery of CPR (https://onlinelibrary.wiley.com/toc/14764431/22/s1). This will provide uniformity in grading the teams. Date and Time: September 17, 2018. The entire event runs from 1:00-5:00pm. Due to the tournament style, teams that progress to the semifinals and final round will need to return throughout the day. Participating teams will be required to check in for the event between 12pm-12:20pm. Please refer to the Tournament Schedule for more detailed information. The event: The CPR Battle will occur in a tournament style. All teams will participate in the first round. Half of the starting teams (i.e. 4 teams) will progress to the semi-finals. At the end of the semi-finals, 2 teams will progress to the final round. The team with the highest score from the final round will be deemed the champions of the IVECCS CPR Battle! Please refer to the Tournament Schedule for more information. *Teams that are participating in the CPR Battle are kindly asked in the spirit of fairness and professionalism to not observe rounds in which they are not participating, in order to prevent gaining an unfair advantage prior to their round. However, once a team has been eliminated or they have completed a particular round, they are more than welcome to observe other teams during the rest of that round. Grading: All teams will be evaluated on both their CPR technique, as well as their teamwork and decision-making process. The technique will be graded based on CPR effectiveness as measured by the simulator using a standardized grading rubric. The teamwork and decision-making process will be evaluated by a judge who is a leader in the field of resuscitation, also using a standardized grading rubric. Do I have to be on a team to participate? Yes, you do need to be on a registered team in order to participate. However, all IVECCS attendees are invited to come and observe. You can cheer on your hospital’s team or just watch and learn. Questions: Please contact Meredith ‘t Hoen (m.e.thoen@uu.nl) if you have any further questions.